een strijkkwartet van Leoš Janáček. ACT I. In a quiet Moravian village, Jenufa waits anxiously to hear if her beloved teva is to be drafted, for she is carrying his child. teva's stepbrother, Laca, secretly loves Jenufa but tries to hide his feelings by making offensive comments about her to his grandmother - who owns the nearby mill - and to the mill's Foreman. The shepherd boy Jano enters, thrilled that he can read and thanking Jenufa for teaching him. It soon turns out that teva is free of military duty, and he staggers in with some boisterous recruits, musicians and villagers, who break into a rowdy dance. Jenufa is distraught over teva's cavalier attitude. The noise incurs the displeasure of Jenufa's foster mother, Kostelnicka. She is a stern widow with considerable moral authority, whose name describes her honorary office with the church where she serves as a sacristan. 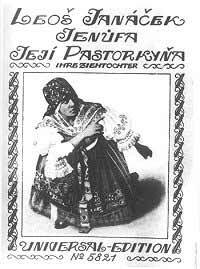 Remembering her own drunken husband, she tells teva he can marry Jenufa only after a year of teetotaling. Grandmother Buryja sends everybody away, leaving teva alone with Jenufa. He is petulant at her plea for marriage. After he leaves, Laca returns, needling Jenufa, finally quarreling with her. Torn between love and jealousy, he slashes her cheek with his whittling knife. She runs into the house, and the servant Barena says it was an accident, but the Foreman accuses Laca of hurting Jenufa deliberately. ACT II. While everyone thinks she is in Vienna working as a servant, Jenufa has remained hidden at home and given birth to a boy. Her proud stepmother cannot bear the shame and has sent secretly for teva. After giving the girl sleeping medicine, she tells him about the baby and kneels before him, begging him to wed Jenufa and claim his son. But he refuses to take a disfigured bride; in fact he is engaged to Karolka, the Mayor's daughter. Next Jenufa's distraught stepmother turns to Laca, who is eager to marry the girl but so taken aback to hear about her baby that Kostelnicka on an impulse pretends it is dead. There is only one way out for her now, she feels. Taking the child, she heads for the frozen millstream to drown him. When Jenufa wakes, she prays for her child, but her stepmother returns to tell the girl she has been in a coma for two days, during which the baby died. She also tells her about teva's coming marriage. Laca returns, humbly offering himself to Jenufa, who reminds him she has neither wealth nor honor. Laca insists he loves her. Conquered by grief, she agrees to become his wife. ACT III. Two months later, Jenufa is about to marry Laca. Among the guests are the Mayor and his Wife - who notices that Jenufa is not wearing the usual white garland - and teva with his coquettish fiancée, Karolka. Barena and some other girls arrive with flowers, and Grandmother Buryja blesses the couple. Suddenly, Jano runs in to say a drowned baby has been found in the thawing millstream. Kostelnicka becomes hysterical, while Jenufa identifies the body as that of her child. Everyone now turns on Jenufa, but Laca defends her, and her stepmother's confession abruptly ends the mystery. Before Kostelnicka is led away to face her punishment, Jenufa forgives the wretched woman. Then she turns to Laca and offers him his freedom. Again he declares his love, and since she has grown to love him too, they put the tragedy behind them and start a new life.